By Jeff Sessions’ standard for lying under oath, Jeff Sessions lied under oath. Jeff Sessions listens as President Donald Trump introduces him prior to being sworn in as the new Attorney General in the Oval Office of the White House on Feb. 9. 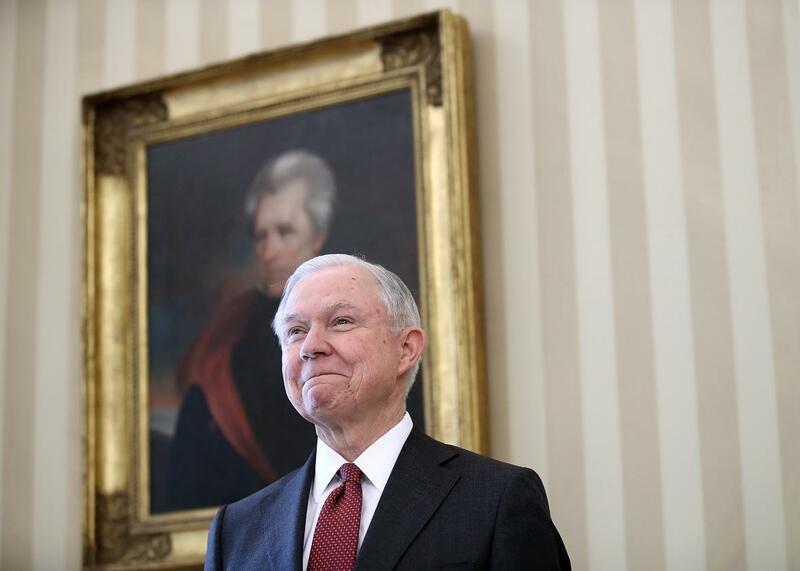 The Washington Post is reporting that Attorney General Jeff Sessions had two conversations with the Russian ambassador to the United States during the runup to the 2016 election, when Sessions was a U.S. senator and a prominent Trump campaign surrogate. During his confirmation process this January, Sessions twice denied having any such contact. In the confirmation hearing, Sen. Al Franken asked Sessions, “If there is any evidence that anyone affiliated with the Trump campaign communicated with the Russian government in the course of this campaign, what will you do?” Although Franken didn’t make a direct query about Sessions’s own communications, the then-senator took the opportunity to say he hadn’t chatted up any Russians, no siree. It’s possible that one-word answer isn’t a fib—the Post and the Wall Street Journal, which also reported on Sessions’ contact with the Russian ambassador, don’t have any information about what he talked about with Sergey Kislyak. But if the newspapers’ reporting is accurate—and Sessions’ spokeswoman has confirmed that he did meet with Kislyak twice—then his response to Franken feels … perjury-ish. Franken wrote on Facebook that Sessions’ answer to his Russia question now seems “at best, misleading.” House Democratic leader Nancy Pelosi straight up called Sessions a liar, writing that he “is not fit to serve as the top law enforcement officer of our country and must resign.” But the White House, predictably, is backing up the attorney general, calling this a partisan attack pushed by Democrats who are insanely jealous of the awesomeness of Trump’s Tuesday night address. That is not a very convincing denial. Franken asked about communications between the Russian government and “anyone affiliated with the Trump campaign,” and Sessions acknowledged in his response that he was affiliated with the Trump campaign. But reasonable people can differ on such things, I suppose. So, how should we decide whether this is perjury or an innocent omission? Freshman Alabama Sen. Jeff Sessions had some thoughts on that very question during the Bill Clinton impeachment imbroglio, when the president stood accused of lying to a federal grand jury about his assignations with Monica Lewinsky. Sessions ultimately joined 44 of his Republican colleagues in voting to convict President Clinton of perjury. His hard-line view on lying public officials did not win out. The perjury charge and a separate obstruction of justice charge (one Sessions also voted for) both failed to get the two-thirds majority needed to remove the president from office. That worries a lot of us, Jeff.